Sport that consists of racing down an icy track on a two- or four-person bobsled; bobsleds reach speeds of over 135 km/h. Bobsled designed for a crew of two (a captain and a brakeman); it is shorter and lighter than the four-person bobsled. 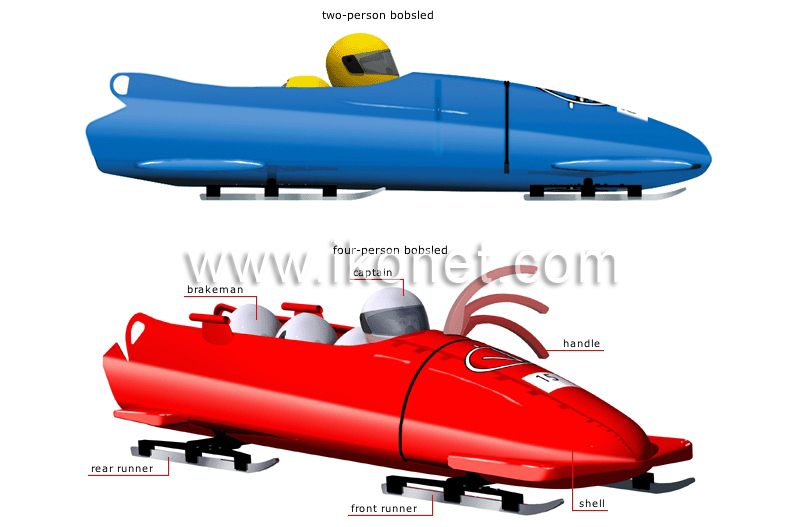 Bobsled: vehicle on runners that has steering and braking systems; the four-person bobsled team includes a captain, two crewmen and a brakeman. Aerodynamic compartment that is usually made of fiberglass; a crew whose weight is less than the allowable limit can carry extra weight. Bobsledder who issues instructions and steers the bobsled; he is the first to take position after the push start and is the only one who does not lean forward during the race. Retractable piece held to push the bobsled during the running start; this start is about 50 m long. Stationary steel blade at the back of the bobsled that enables it to slide over the ice. Bobsledder who operates the brake after the finish; the brakeman is the last to climb onto the bobsled at the start. Movable steel blade at the front of the bobsled that enables it to slide over the ice; the front runners are connected to the steering system.